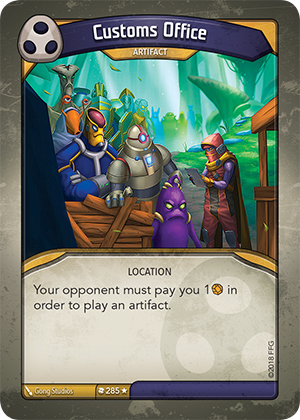 Card Text Your opponent must pay you 1 in order to play an artifact. What if I have Customs Office in play, my opponent has no Æmber, and they try to play an artifact? If they cannot pay you 1 Æmber, they cannot play an artifact. Likewise, if an artifact is played via Wild Wormhole and your opponent has no Æmber, it cannot be played and is returned to the top of their deck. If I have Customs Office in play, does my opponent have to pay 1 Æmber for each artifact they want to play? Yes. This effect is always active so your opponent has to pay each time.